Suitable for grow your own. Lasts up to 2 weeks. 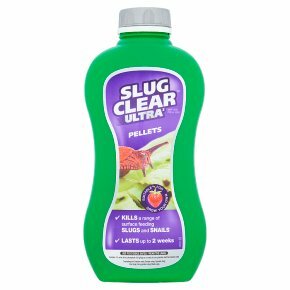 Kills a range of surface feeding slugs and snails* *Including the Garden snail; Garden slug; Spanish slug; Red slug; Grey garden slug; Black slug Contains 1% w/w ferric phosphates (10 g/kg) as a ready to use granular bait formulation (GB) SlugClear?Ultra 3 pellets act as a bait, efficiently reducing the damage caused by slugs and snails, with one application lasting up to 2 weeks. SlugClear? Ultra 3 pellets contain ferric phosphate which occurs naturally in the soil. Instructions for Use: For use only as a home garden slug and snail killer. For use on bare soil around strawberries, salad crops, brassicas, ornamentals and flowers. Read all safety instructions before use. When to Use: Outdoor use: apply pellets in mild damp conditions when slugs and snails are most active. If using in greenhouses, soil should be damp, not wet. Use SlugClear? Ultra 3 pellets during the slug season (spring or autumn) when the first signs of slug or snail damage are visible on plants. Where to Use: Apply to bare soil around the base of strawberries, salad crops, brassicas, ornamentals and flowers to reduce slug and snail damage. Make sure to apply pellets evenly over the whole area of plants that you want to protect ensuring that pellets do not rest on, or become trapped in the leaves or other parts of the plants. How to Use: Use SlugClear? Ultra 3 pellets at the first sign of slug or snail damage. Sprinkle the pellets evenly and thinly over the soil around the plants to be protected, so that the individual pellets fall 8-10 cm (3-4 inches) apart (approximately 140 pellets or 3 g/m2). Do not put on the ground in heaps. Maximum individual dose: 3 g product per m2. 685 g is sufficient to treat 228 m2. Repeat application after 2 weeks if further protection is required. Maximum number of treatments per year 4. Avoid excessive irrigation or watering for a few days after application. Safety interval between last application and harvest or use and consumption: none. SAFETY INSTRUCTIONS:<br>Protection during / in use<br>AVOID ALL CONTACT BY MOUTH. KEEP OFF SKIN.<br>DO NOT BREATHE DUST. WASH HANDS AFTER USE.<br>KEEP AWAY FROM CHILDREN AND PETS BOTH IN STORAGE AND IN USE. KEEP CHILDREN AND PETS AWAY FROM SPILLAGES.<br><br>Environmental protection<br>Do not contaminate water with the product or its container.<br>Do not empty into drains.<br><br>Storage and disposal<br>KEEP PRODUCT IN ORIGINAL CONTAINER, tightly closed, in a safe place. PROTECT FROM FROST. KEEP AWAY FROM FOOD, DRINK AND ANIMAL FEEDING STUFFS. KEEP OUT OF THE REACH OF CHILDREN AND PETS. Do not re-use packaging.<br><br>Risk and Safety Information<br>To avoid risks to human health and the environment, comply with the instructions for use.<br>Read label before use.<br>Keep out of reach of children.<br>Do not eat, drink or smoke when using this product.<br>If medical advice is needed, have product container or label at hand.<br>IF SWALLOWED: call a POISON CENTRE or doctor/physician if you feel unwell.<br>Rinse mouth.<br>Dispose of contents/container to a household waste recycling centre as hazardous waste except for empty containers which can be disposed of by recycling.<br>Contact your local council for details.